The main relevance of this supposed symptom is how it cause so many chlorine attack fatalities to, as I recently panned it, "just sit there and die." I decided to put my foot down on this subject while reviewing a Human Rights Watch report, detailing 9 to 16 fatalities from eight attacks in rebel-held eastern Aleppo in late 2016. In perhaps every case where the chlorine bomb fell into or near someone's home, everyone inside apparently passed out or got paralyzed, and inhaled a fatal amount before anyone could come rescue them. Some might have been alive still, but they'd be well doomed by then and die eventually, no matter how good the medicine. This instant blacking-out is also reported in earlier attacks, back into 2015 and 2014, and has been the norm - individuals and whole families just sit there and die every chance they get. (some review at the end). That's obviously not because they're so dull, but because they passed out, or become paralyzed, early in the process and couldn't do anything after that. However, the people telling and selling this story seem to be some combination of liars and idiots. Chlorine does not make the victim just black out. Maybe the core research was done by some Islamist watching the cartoon show Futurama. In this scene, a chlorine gas cloud is produced after "Nibbler" drinks an entire swimming pool and then burps. The non-robots cough a bit, and then tip over unconscious and lay there. The immune robot laughs, then rusts and tips over. That seems like a good fit with the cases reported out of Syria. It starts out right, but quickly goes wrong, from a scientific standpoint. (An accurate response wouldn't be funny at all, like this sort-of is) Let's take a moment to consider this as if it matters. The basics: chlorine turns to hydrochloric and other acids on contact with water. So moist tissues like eyes, airways, or sweaty skin will be damaged by droplets of highly corrosive acid. That's how it kills germs in water, and how it would kill a human or animal. The effect is mechanical, and the injuries are incurred during exposure, however intense and however long that is. The patient remains conscious, but starts coughing, eventually with blood coming up (they would want it to, to make room for air). Death only come later, as chronic low blood-oxygen, damage to the lungs, and the body's often fatal response play out (a secretion of protective mucous often comes far too late to help, and contributes to suffocation). There's little that can be done medically to reverse the damage. Medics can suction the lungs and provide respiratory support to keep the patient breathing until, hopefully, they pull through and heal. But other times, even that's not enough and the patient dies after a long struggle. Severe headache rapidly follows with a feeling of great weakness in the legs; if the patient gives way to this and lies down, he is likely to inhale still more chlorine, as the heavy gas is most concentrated near the ground. In severe poisoning unconsciousness follows; nothing more is known about the cases which prove fatal on the field within the first few hours of the "gassing," except that the face assumes a pale greenish yellow colour. "Not all of the signs and symptoms exhibited by subjects exposed to moderate to high concentrations of chlorine gas are caused directly by chlorine. In general, it is believed that effects such as nausea and vomiting are reflex in origin..." (you cough so hard you throw up) "...and headache and loss of consciousness are probably due to the hypoxia caused by pulmonary edema." That is, fluid-filled lungs keep oxygen from getting into the blood (hypoxia), and hence to the brain, leading to an oxygen-starved brain (cerebral hypoxia). This causes headache - a very common symptom - and to unconsciousness - seemingly less common. That situation will require some minutes at least to develop, and longer yet to get that bad. However common, headache and passing out aren't really primary signs - they're common to many different poisons, and other more obvious and specific signs should appear well before these. Other sources I've read suggest people usually don't lose consciousness at all - they remain aware and responsive until the moment they die. When they do lose consciousness, most commonly, it's a short final stage before they finally die. That is, it's more of a last thing than a first thing. For anyone who does finally black out, they should usually get out the door at least (in the Syrian home scenario), though if the damage is severe enough, they may not get much farther before they're breathing so bad they finally collapse. But the first minutes should always be a time consciousness and free will. Wracked with pain, panic, and harsh coughing, still, they'll try to get away to fresher air, and most should succeed. So I stand by this rule of thumb: If someone seems to just sit there and die from a chlorine attack, something unusual is probably at work. That can have various innocent causes in fluke cases, but if the pattern is too prevalent, or other counter clues exist (both apply across the record in Syria), it's probable that the chlorine-bomb story just isn't true. Much evidence and logic, in many cases analyzed over years, suggests that anyway. In fact, it often seems the victims might have been hostages of the opposition/Islamist forces, intentionally gassed to death as propaganda devices, with the intent to get their enemies in more trouble and encourage foreign intervention. But whatever the explanation, the one offered is inadequate, and that suggests some kind of cover-up. Add 3-16: One important aspect I overlooked at first. See below: When People Stop Walking. If you want to try and debunk me here, this is probably the avenue to explore, the best reason people might just lay there and die. But as I explain, I don't think it's adequate either. WWI deaths happened because of trenches and enemy fire, and massive clouds made on purpose, using winds deliberately to kill - not common anymore, but industrial accidents can cause them. There are probably many examples all over the world, but three from here in the US come up prominently. None of these mentions unconsciousness, nor specifies that everyone stayed awake. But the third case at least offers some useful insights. 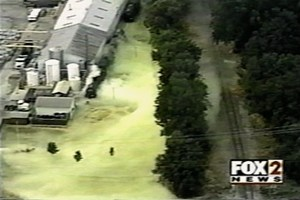 First, a case with no deaths and little detail on symptoms, just for the visuals and an idea of how it spreads On August 14, 2002, tons of chlorine was released at DPC Enterprises in Festus, Missouri. An incorrect hose type corroded from the gas, and the safety shut-off failed. 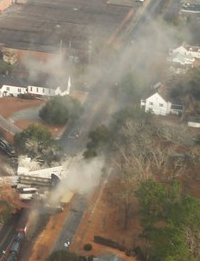 The resulting deep cloud, 48,000 pounds spilled, was captured on video, pinned between the plant and the raised railroad tracks. CNN's report sounds almost like those from Syria at the same time, but truer: "Those in the area said the gas smelled strongly of cleaning products. Many nearby began experiencing breathing trouble and tightness in the throat. ... Effects of the chemical ranged from minor respiratory issues to severe respiratory issues," with no mention of losing consciousness. One report noted "Pacific Steel could not say if Dumaw was operating a crane or on the ground at the time the chlorine gas was released into the air." (Green Bay Press Gazette) If he was the crane operator, he might puncture the tank while it was close to the cab, but wherever, he was probably closest to it, and got the most concentrated blast, maybe right in the face. This would causing massive damage in a matter of seconds. It's probably amazing he managed to live three days. Did he lose consciousness, or walk out alert but in crisis? That's the question, but the answer still isn't clear. I was thinking of calling to ask around ... but I don't think that's necessary. Nothing so far suggests he or anyone should have passed out, and there's no mention of it. The next case may settle it. Around 3 am on January 6, 2005, an accident led one train to crash into another that was parked, near the Avondale Mills plant. The moving train (wrongly routed by negligent track settings) was carrying several cars worth of chlorine products, which largely wound up spilled. At right is a view from the morning after, following the worst of it (cropped from the photo used at Wikipedia - note the very pale color here - this is fairly well dispersed). ...the train’s engineer (who had survived the crash), three workers in the mill, a truck driver sleeping in his cab, a man in a shack one block from the wreckage, two workers who had evacuated the mill on foot into the woods, and one other person (7). The dead victims are mostly employees of Avondale Mills, working at the plant at the juncture where the crash happened. Anyone who died at their work station is a candidate for instant loss of consciousness. But we don't know their stations or often just where they died. But in many cases we can see they died some distance away. Considerations: early morning attack, it's dark, and not as many people are around. A badly gassed person could get inside, find a phone in an empty office, call 9-11, cough blood and gasp into the reciever, lay there dying, and be found dead, or found alive, but then die in the hospital. They might go what they think is upwind, and it might be, but if they breathed too much and upwind is into the woods, they'd die choking alone in the woods, and be found in the morning. Also note: rescuers were told to hold back, not having the right protective gear. The plume drifted many miles, for days, but it was dispersed and no deaths were reported out here, just immediate acute inhalations, and the stray victim #10. And here's a lesser known point of some interest: a piece at chemicalspill.org explains how "some trying to flee had difficulty starting their cars and trucks as the chlorine worked with the humidity in the air on ignitions. Cell phones also did not always work for the same reason." 8) truck driver, found in his truck cab, dead - maybe he slept through the first part of breathing it, woke up in crisis but spent too long trying to drive away, couldn't start the engine (noted problem), could have stepped out in the cloud and tried to walk away, but likely died in the driver's seat, maybe after realizing he was doomed and giving up. 9) found in his home, dead - Maybe prior medical problems, woke up at the crash noise, fell back asleep with a vengeance (took a pill? might need them, living so close to the tracks), breathed a weaker concentration for a while as he slept, and woke up too late. I bet he was out of bed, maybe had the phone in hand and even called 9-11, but he didn't make it to the door. Likely 20 others had a similar story but fared better and lived, most of them easily. This last might apply to the November 20 incident and other night-time attacks in Syria, where people were caught sleeping. Except it's harder to sleep through chlorine released from a barrel bomb that fell through your roof. You'd wake up right away, and sleep through none of the damage. So, no, this doesn't help in the Syrian home scenario. Severe headache rapidly follows with a feeling of great weakness in the legs; if the patient gives way to this and lies down, he is likely to inhale still more chlorine, as the heavy gas is most concentrated near the ground. We've already established that headache, besides unconsciousness, is caused by low blood oxygen. It won't be instant. The weak legs will be fatigue, strong there as one runs to escape the cloud. This is likely the same: not enough oxygen for the muscles to work easily. This mobility problem could cause a victim to lay down, if not fully until death, at least until they got a fatal dose. But these were WWI exposures, to fit soldiers, but ones with mammoth plumes sent over them, and nothing but fields and trenches around. There was no up, usually, and if there was enemy gunmen had it covered. The nearest edge of the cloud might be a kilometers away and hard to know which direction. Having no escape might have amplified the variable effect of the legs - and maybe the whole person - just giving up, and even seeking a denser cloud to get this affair over with. In other circumstances, it might be less of an issue. But a similar inability to walk, as well as a sort of paralysis and falling down feature rather heavily in this semi-recent accident story where chlorine sounds almost paralytic. This was in Tulare, California, in June, 2010 (not one I noticed in my first search). Like in Spokane, this happened at a recycling plant where a non-emptied tank with chlorine was ruptured. Scientific American would report on it 16 months later, with employee Beverly Martinez giving the most details. Not a floor worker but someone with an office, she was there when the gas hit. A couple dozen people – workers and customers – dropped to the ground, gasping for air. Martinez fell, too. Almost instantly, it sounds like, she was sort-of-paralyzed. "I couldn't get up. I felt like I was being strangled. I thought, 'I'm going to die. I'll never see my granddaughter grow up." But then she did get up, and started moving towards the building across the street. Then she ran into co-worker Ricky Mejia laying on the ground, calling for help. He was an inspector, and may have gotten a bad dose when he went to inspect the accident. When she put the options as walk or die, they all resumed on their own to safety. No one was really paralyzed, no one blacked out, and no one died. 23 people were taken to hospitals, and 6 were admitted. Two suffered severe exposure and had to be put on life support. One was Ricky who thought he couldn't walk at first. He was kept for 11 days before he was fully recovered. Ongoing problems 16 months later: lung problems, stress disorders, stomach problems (probably from the stress). This apparently was a large cloud that took a lot of walking to fully escape, but I suspect it was not terribly dense, or someone would have died. The article says concentrations were measure at "328 parts per million near the tank" afterwards, which is very high and easily fatal (33x the IDHL rating). It would be even higher at the beginning. But it must have been far weaker in the swathe Beverly dragged half the crew through, because none of them died. By this unusual account, the anomalous response so common in Syria almost makes sense. But in fact, this story sounds odd, and may not be the exact truth (possibly embellished, or just not remembered right because of the trauma). But let's just take the story; maybe there's sometimes a sudden fall when the bad air first hits you, like the wind being knocked out of you - you might drop down into the cloud, kneeling or laying. Then maybe there's a period of paralysis, and/or a perceived inability to walk that makes people just lay on the ground. But if so, we also see it tends to be optional - everyone in this story got over it, got moving again, and lived to tell their own story. In "Free Syria," that seems not to happen. No one gets out, or helps anyone else get out. They all die, and someone else tells the story for these peculiar victims. In fact, I can see some pro-rebel think tanker in the UK, with no science background and used to thinking of the Syrian people as passive props... he's drafting the list of symptoms to claim, fake, or cause in order to convince outsiders of chlorine use (drafted as "watch for these signs of Assad crime and report it swiftly"). He's eating cheese crackers from a box set sideways. He scans this very story while pondering the low-fatality problem (Of course, a few folks will have to die in order to spur intervention). Bingo! He decides paralysis and laying there is a feature to watch out for, what the Brits consider a valid sign ... and that will explain why x number wind up dying, tragically, on rebel videos. Wouldn't that be (darkly) funny? Because something similar was in Scientific American ... besides on that Futurama episode. The rabbits don't like breathing it, and blink their eyes as if irritated. The white rabbit doesn't just blink but squeezes its eyes shut most of the time, and also seems to sort of sneeze or cough a few times, and might be bleeding from the nose. One tries to get higher or escape early on, and the other only after a period of (denial?). Eventually one panics, and they both start trying, with increasing urgency, until - about two minutes in - they slip and trip over each other on the plexiglass, then struggle for several moments on the floor, but cannot get back up. They stop trying and lay there, but likely remain conscious. It seems they simply gave up at that point, and it's hard to say how quickly they black out or die after that. They remain kicking and wiggling a bit for many seconds, and then camera goes back to the narrator, who starts talking about the humans he hates, and hopes to gas this same way. Add 3-16: This is another case for the victim just laying there file, alongside many fatalist WWI soldiers. As in those cases, though, we have to ask what friggin' option did they have? I don't think this is passing out, but tiredness plays into it. I think it's a conscious choice to give up and wait for the blackness. This shouldn't apply to any but the most severely depressed citizens who are free to move, and just a few steps from the exit of their own house. In fact we could say if people really do just sit there and dire from chlorine, as alleged, they're more likely to be in a situation akin to a rabbit cage, than to being at liberty in their own homes. We see no indications that people normally just sit there and die. In massive incidents, a few fluke cases might. But what they're reporting in Syria makes little scientific sense, and it might be a complete lie, of the kind they've been caught telling before. Here, I'll try and review all related cases, with some notes on just how they sat there and died. ...all with the relevant details unclear. But most affected displaced families (IDPs), which is its own issue, suggesting possible captivity - if so, they also will have just sat there and died, from whatever, likely in some gas chamber. April 11 - IDPs, 2 immediate deaths, from head wounds - a delayed death in Turkey, from the gas - not a good example. May 22 = IDPs OPCW: "a mother aged 30 years, her sister aged 16 years, and two children (a five-year-old girl and a four-year-old boy) belonging to the same family" - details unclear. "(the victims) had gone down to the basement to seek shelter from the impact of the explosion, as they usually did, which led to their immediate suffocation as the gas, being heavier than air, slipped down to their shelter." "... The whole family was moved to the field hospital while still alive, but they were so severely affected that the medical staff failed to save their lives. Due to their exposure to high levels of the toxic gas and the fall of the barrel directly on their house, they died one by one." “We were told that a family lives in the basement. Three of us went down the stairs. I took one breath and (blah blah) I saw a woman on the stairs. She was blue and was not breathing...."
This the grandmother in the family. She stopped moving, passed out, fell asleep, before she got up the stairs. I know the site, there are many stairs, so it's hard to say how far she allegedly got out of the small apartment, which I doubt they really lived at (the children shown on video clearly were not exposed to any serious amount of chlorine). And none of them could move until then, not even to get out and onto the stairs - they just sat there and died. Five people. Only the oldest one tried to leave everyone behind and half-succeeded. Does this make any sense? Add 3-16: The OPCW were told a different story: the parents and the boy, Mohammed, managed to get out of the house ... while grandma and the girls didn't. That's perhaps half-plausible. (UN report, page 84) In another version, they say the same but goof up ages, claiming the parents and the oldest (male) child escaped (OPCW). But Mohammed was the youngest. And everyone else, talking straight to the public, is clear that he and both parents just laid there inside with the girls, until some White Helmets types showed up to save them. 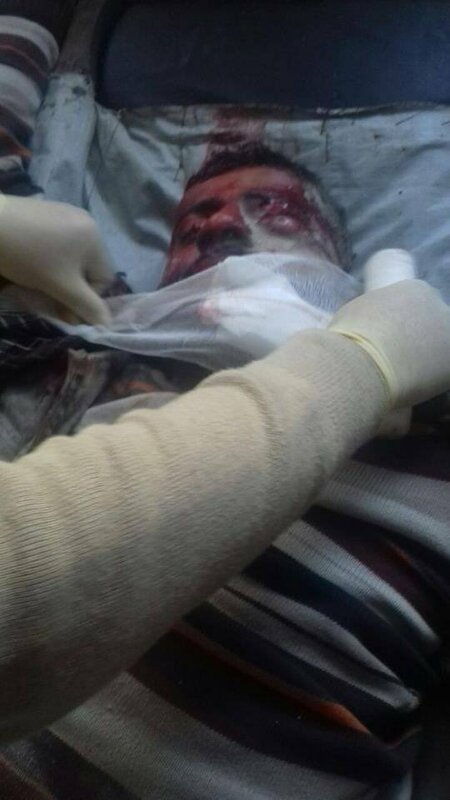 2) March 31: little info - one man died in Idlib city, in chlorine bombing just after liberation - vacuum missiles and more were said to kill far more, and Islamist victory massacres of soldiers, minorities, or anyone apparently didn't happen at all (by reports, anyway). "I saw a small child wrapped in blankets but I couldn’t reach him. The third time, fluid started streaming from my eyes, my nose, and my mouth. I felt like I was going to pass out. I started running and I lost consciousness. I didn’t wake up until other civil defense workers washed me with water." That's just not correct, if this is chlorine. He claims he couldn't even outrun the swift unconsciousness caused by... as we've learned, sometimes, from pulmonary edema triggering cerebral hypoxia, after a prolonged struggle with badly damaged lungs. He doesn't even mention his lungs or coughing. It sounds more like sarin, maybe. But he wasn't alone: the older man and his infant son never moved from where they were inside, as if chlorine freezes you in place, like sleeping beauty, until a shining White Helmet can defeat the chlorine dragon, break into the castle, and kiss you. 2) Sept. 6 - "Some fainted and vomited, one doctor said." (HRW) one teenage girl and a younger man both reported dead from the chlorine - both are likely seen in different videos, and neither looks like a chlorine victim. No known details on how they were supposedly exposed. They were all in the house. Maybe one child made it out the door, or was somewhere else? All are seen in full street clothes, after this midnight attack, but with no shoes. Did they sleep in their clothes, or manage to get dressed after waking up? Because the did not get out to safety, before they tipped over and became passive props in the story, waiting for rescue. "We were sleeping when a barrel bomb fell near our home," a man explains on the video. "We went down and discovered it was chlorine gas. The victims weren't activists or anything ... but they were suffocating so much, they turned blue. It was a man, four kids, and his wife. The oldest boy was 10 years old. Why did this happen? May God curse you, Bashar (al-Assad)." 5) 11-28 - "Firas Badawi, a photographer with the Aleppo Media Center ... saw a helicopter ...the munition had hit a playground ... "We rescued 11 or 12 people who had sought shelter in surrounding buildings, fearing an explosive barrel attack. Most had lost consciousness and there was foam coming from their mouths. We thought they had died. Others couldn’t breathe and were screaming from pain in the chest, coughing and burning in the eyes." (HRW) - 2 reported dead, no details at all. 7) 12-9 - 5 reported dead, no details at all. 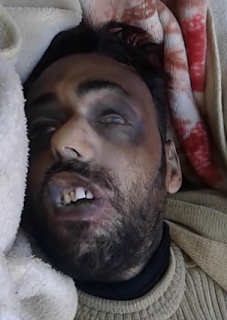 1) Feb. 9, Irbeen: one rebel died, no one else apparently just sat there and died, but some people did pass out. As noted at the top of the article, activists reported "symptoms consistent with chlorine gas exposure including; difficulty breathing, loss of consciousness and foaming at the mouth." = 17 fatal incidents total (dozens and dozens of non-fatal attacks reported). The number of fatal attacks isn't necessarily that high considering, and the numbers of dead aren't really suspect. It's these incorrect little details like instant black-out, and other signs of cover-up, that makes these claims so dubious. On February 15, 2016 (a year ago), Medecins San Frontiers (MSF, Doctors Without Borders) lodged complaints that Russian and Syrian airstrikes had destroyed one MSF-supported clinic in Idlib province, and then targeted a second hospital nearby. They claimed as a fact that 25 civilians were killed, and 11 wounded, in these attacks. Previous reports compiled at ACLOS; our coverage of this case was not very complete, and a year later I have no ready debunk. The problem usually lies with the unproven backstory attached to the video events. It's often like this: "yes, this is where the event that rebels seem to be lying about occurred, and that's the aftermath of it. They probably killed those people, and that's why they've got the bodies in their pickup truck," etc. Still, this probably deserves a full double-checking of their video analysis work. But I'm swamped. In fact, I may do this with no visuals, to help raise the point that a snazzy visual analysis doesn't always prove the truth behind the appearance. With some thoughts from others, and just one decent review of the videos, I'll also try for a quick review here, for now raising more questions than answers. Again, having not double-checked their work except to see that it's likely correct and not obviously wrong ... Forensic Analysis adds seemingly valuable analysis to show these blasts happened about when and where they were reported. It adds more than usual in this case, which is probably why they picked it. I've seen some terrible stories fall apart like wet cardboard as soon as I pull them open. In this case, not immediately. But I think the who, how, and why still are open to question. We should note at the start, as MSF may not have considered, hospitals may include or be near militant targets, and be destroyed or damaged in the course of necessary fighting. If either jet strike is real, was there a legit target in the same area? - 1st attack, at Atibah al-Haboud hospital in Al-Hamidiya 6 km south of Maarat al-Numan (here on Wikimapia). Four strikes total are claimed - the first two at 9:02 and 9:05 am (and the third unexplained)? - Geo-location from two video angles shows it is the building they call an MSF-supplied clinic that was destroyed and smoking around 9 am ... from something that happened. They say it was a jet attack. They show video of the scene, that appears like the right time. If that's the real damage they show, it was powerful: I'd guess a car bomb, or a few heavy air-dropped bombs. Or a few larger surface-fired rockets/missiles. Most of the building is collapsed. One outer wall stands partly, but slumping. A corner stairwell-type portion is the only thing of size that really stands.If this really was a MSF-supported hospital, then one of those was destroyed, somehow. - @2:02 -Around 9:45 (as reported, could be), after rescuers arrived, a strike (or two) seen on two video - one is described 4th Russian strike, and of a terrorist "double-tap" sort that targets rescuers. And they do run, as if the ruins would be hit again, as a jet is heard. @4:15 we hear a loud whoosh and boom, but see nothing, in either of two videos. Fakery would be complicated here - just audio editing would be needed, but also running, coordinated with the blasts, knowing sound effects would be added (we'll fix it in post). This is imaginative, but I don't suspect it's the case. Whatever the first blast was, this seems to be an airstrike. -The loud blast has a few smaller, follow-on explosions. Are these cluster munitions? (big but few) or is this an ammunition depot exploding, perhaps? This deserves some more analysis by someone who could really offer a good opinion. - It's not clear if they placed just where this strike was in relation to the hospital. It can be seen in frame, but the blast is somewhere else (see @5:02, sun and hospital ruins to the southeast, blast one km or more to the south). The other video is the same: people at the hospital film the distant plume rising. What was off to the south? About 2 km south, according to Wikimapia (see link above), is a stretch of the M5 highway to Damascus, with an "army checkpoint" (may be militant-run checkpoint now) on one side, and an electrical substation on the other side. There's little else but fields before that or further out. so I guess this strike was about 2 km south of the hospital, which was already in ruins anyway. Not much of a 4th strike on the hospital, and not very effective deliberate targeting of rescuers at the hospital. Still, the charges stand. @2:37 2 videos show strike on national hospital in the north of Maarat al-Numan, as soon as Atibah's director arrived, having left his ruined clinic around 11. Two cameras captured twin blasts near the hospital, and one view easily sets the time at about solar noon (MSF got 11:55 am) Lines of sight seem good. One view is clear, as MSF's analysis is, that the hospital itself wasn't hit. @3:09 area indicated - not exact, but almost surely one hit was on the hospital grounds, a ways southeast of the main building, and the other hit a bit to the south, outside the grounds. There's little there but the road to the hospital and one small shack nearby - no likely militant bases or facilities there. @6:00 - a jet-shaped blur is seen for a few frames at the attack time. They think it's possibly a Mig-23, which only Syria uses, but that's extremely vague - it could be almost any jet from the pixels seen. And the pixels could be real, or added. It even seems to show payload dropping over the hospital. This seems almost too-good, but it doesn't look obviously fake, and I usually presume no CGI is used. But it is possible.This and the added jet noise would be to obscure the reality of an incoming surface rocket. But I'm leaning to this being real. - The lack of close-up of damage or specific claims of damage suggest MSF acknowledges the National Hospital was only "targeted," or hit near. If their work is correct, they show areas near the hospital were hit. So "another hospital that was targeted later the same day," but it was targeted poorly. Or maybe it didn't seem as expendable to the false-flaggers. Or ... The MSF-connected hospital director had just arrived, others may be following - was this perhaps a legitimate terrorist target of the mobile kind? - unverified claims of Russian and Syrian jets taking off shortly before each attack (a rebel "observatory" claims to watch takeoffs, and might) @3:55 - Opp. sources claim they saw Russian jets take off from Hamayman airport, and carry out the first strike and watched a Syrian jet take off from Hama and hit the national hospital. It's not clear to me they really did, but perhaps. Do they have radar to follow it? Or is it just presumed (takeoff, then blast = hit by that jet)? Because it might be a false-flag rocket attack instead, timed to line up with a jet sortie, real or fabricated. But maybe those are the jets that did these strikes. Were they engaged in criminal operations, or in legitimate ones? So the claims line up with real-world explosions, but the actual story makes as little sense as usual and remains open to question. Just to be evil and deny medical care to innocent civilians, whom Russia and Syria are constantly bombing, the Russians blow up a hospital, bomb it some more but miss by 2km, and have their Syrian lackeys blow up the replacement hospital ... but miss by a bit, twice. And good enough - they can get some fresh charges out of it and they're happy, right? I lean to one of the real jet options. Is it possible these were false-flag jets? Not likely, I should think, this far into Syria. However, that's been alleged in Russia: Sputnik, February 16, 2016 "Airstrikes on a hospital affiliated with Doctors Without Borders, or Medecins Sans Frontiers (MSF), and a children’s hospital in Syria were carried out by aircraft departing the US Incirlik Airbase in Turkey, a member of the Russian upper house’s Committee on International Policy said Tuesday." The same accusation was lodged, regarding February 11 allegations in Aleppo. But that needs a grain of salt, with the counter-claims for takeoff, including Russian jets, and neither version proven that I know of. It wouldn't look good, of course, if Russian sources (but not the MoD) denied their jets were there, if they actually were. Still, maybe they were and maybe it's still not criminal anyway - maybe some fool decided to deny it, instead of explaining. No one else has backed up these claims, that I know of. So there's a strong counter-accusation, but I suspect, more than likely, these are Russian-Syrian attacks, against either legitimate or illegitimate targets. Probably legitimate, in my view, but the question seems an open one. MSF seems to think it's not. I'm curious why, because the evidence they present isn't adequate to consider the case closed. @1:47 - sounds like there was shift change at the hospital (?) at the time of attack (9 am, almost on the hour, as reported). So they had no current (?) patient count. So the "White Helmets" "civil defense" rescuers didn't know how many hey were digging for. It's not clear why, but the video takes a moment to explain this. They could just dig for whoever, or use the last known count if they must have a good guess. But maybe they presumed there was no one and didn't dig, and that's why so many died? No, they're seen digging a bit, before they pull back. Did they stop then, since it was thought empty, and the danger was so high? That's Russian danger, terrifying even at 2 kilometers' distance. Who could blame them? And so, perhaps, the unfortunate, randomly selected victims of Russian bombing mostly just died ... right under that rubble. Right? (recalling the other one was never hit, all fatalities should be here). How did MSF ever know 25 civilians were killed, and 11 wounded? The number is usually just handed in by local, Islamist-affiliated activists, and accepted with no questions. I'm pretty sure they don't know and can't verify who died how. I probably have a much better guess than they do. Checking the VDC database, as I usually do, the victims are suspiciously similar to the usual for shelling anywhere, but a bit different. 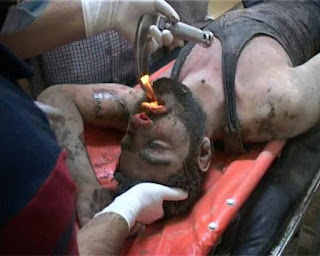 The note "Due to Russian air forces shelling of Doctors Without Boarders' hospital" appears with 16 killed on 2-15. Using just "doctors" in the notes, and given five days to find everyone, gives 22 total . All civilian. not a single militant killed, according to this. (in fact, no Idlib rebels killed by bombing at all 2-15, nor from anywhere else but killed in the whole province.You can hardly hit zero rebels unless you're aiming for zero rebels. This was all about killing civilians! Illogical, sure, but a serious war crime! Some family lumping from patients and visiting family is likely enough, but these could also be unrelated hostages that were killed off. Lots of men there to support a male patient with al-Staif al-Ghajar group. What this might suggest is hostages, mostly men, but one complete family, another husband and wife, etc. They would likely of banned minority groups (mostly Alawi, but some Christians), and maybe a Sunni family related to an army officer or high official. Maybe if demands weren't met, they might put the captives in the hospital/militant base they suspected would be bombed, or put them there and bombed it themselves, or killed the people somewhere else and just blamed it on the hospital strike. Or maybe, as MSF seem to take as the only option, all these people were getting innocent treatment there when the Russians blew the hospital up. I'm not in the same business some are of just ruling things out. A recent HRW report relates a string of eight alleged chlorine attacks last November and December, as the government of Syria re-conquered rebel-held east Aleppo (Monitor analysis, see also ACLOS page and talk page) An incident in the early hours of November 20 is the deadliest in the set, and worth some scrutiny. 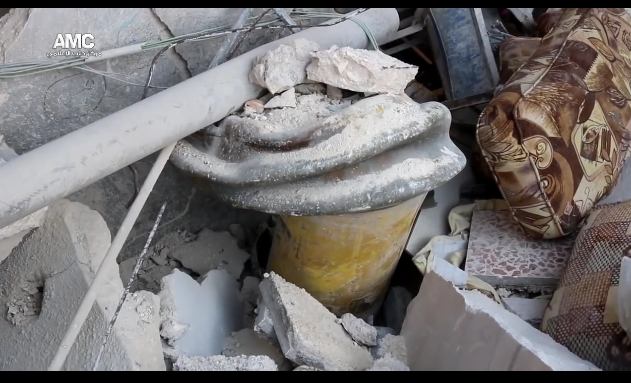 The yellow chlorine cylinder dropped from a helicopter, "witnesses" say, is shown in a damaged home, with some other junk on top of it (right, from a video linked in the HRW report). Note 2-24: I'll probably be reviewing the videos and doing some scene analysis in time, which might reveal more clues. But so far, no review or notes. Activists claim a family of six lived here, and all perished here. A mother, a father, and four children, just sat there and died. Having lost consciousness at the outset, they breathed too much of the caustic gas before anyone could carry them out. But as I'm in the process of explaining in a definitive way (done, link), that makes no actual, scientific sense, no matter how often it's repeated. Chlorine does not really cause unconsciousness, at least not instantly. In fact if one were already passed out, it might wake them up like smelling salts, as the lungs start burning, and then the eyes. Realistically, they might sleep through a bit of it, but then get out the door at least before collapsing, and finally die later on at the hospital. Who were they? A Christian Family? This Reuters report is the only source to offer a partial identification for the slain family. "Two medics said the al-Baytounji family had suffocated to death because the barrel bomb, which fell in the Sakhour district at about midnight, had been laced with chlorine gas." The HRW report passes this on, but they couldn't verify it. The SOHR couldn't verify the name, or the chlorine. Sakhour, Aleppo, killed 11-20, all by Syrian air strikes - 10 civilians, all "unidentified." This could be the reported family of six plus four others, men or blank, related or not, unclear. Presumably it's four others killed, in alleged shelling but presumably not by chlorine. All entries seem to blame "Helicopter shelling" with "explosive barrels," but maybe it was those yellow tanks, and the VDC's sources didn't get the memo in the chaos. That they didn't get the names either supports that. That name - Baytounji - is interesting. It may be a Christian one. I was able to assemble it in Arabic from scratch: بيتونجي. I plugged this into the VDC and found nothing. I tried some internet searches and found it appears occasionally as a word that won't translate, but sounds right: (phonetics given as "bytwnjy") and not usually as a name. I found only one result that made sense and seems to be a name- an old essay in Arabic, maybe from Turkish or verbal records, relating to "construction of St. George's church district Syriacs" (Syrian Christians) in the 1930s. "After the stability of the Syriac community in the city of Aleppo," the auto-translation says, "the Rev. Joseph priest (alqas yusif qsaan) of the Syriac Orthodox Church" is involved. They needed a new church, or at least a new roof, and one guy involved was apparently named (as Google translate gives it), "Mr. Ibrahim Hajjar Betonge" with the last name being the Arabic بيتونجي. He was maybe a donor; in 1933 someone asked him for "share for the construction of the roof..."
Note 3-14: See below, name considered, for more on this name. Also noting St. George's Church in Aleppo is likely the same one currently labeled on Wikimapia, near but not in present Assyrian district. In 1933, it was said to be in the Assyrian (Christian) quarter. So it's a very rare name, linked to Syrian Christians around Aleppo. Here, as Islamist rebels are about to flee parts of that same city and can't take hostages with them, a family of this rare name dies, blamed on chlorine... Add 2-21: A CNN report refers to these same victims: a neighbor says "the victims weren't activists or anything ... but they were suffocating so much, they turned blue." In fact, research suggests they might have been the kind that not only doesn't support the Sunni extremist rebellion,but that sometimes get kidnapped by it. As the group view (again at right) shows, the children at least did get out of bed and get dressed up in daytime clothes, pretty quickly after this "shortly after midnight" attack... strange that. But they have no shoes on their feet. This may be a fist step of basic body processing (before full stripping, washing, wrapping, and then burial). But shoes are often removed before an Islamist executes you. Note: hostages aren't given pajamas to sleep in, and don't even have to die at the stated time. And they don't need shoes if they aren't going anywhere. But shoes or not, they didn't get out the door in time, and died inside from the chlorine gas. But these don't look like normal chlorine deaths. That causes red, irritated or damaged eyes, skin burns, coughing up blood and mucous, and often cyanosis, a blue color shift in the skin. What we see here is something quite different. * Group video on Youtube: +18 The New Holocaust made by Putin & Assad in Aleppo 20-11-2016. The same on Facebook for now, better resolution, stills used below. * SyrianArchve.org copy of truck video, described "One family (4 children and their parents) have died as a result of suffocation caused by the chlorine barrel bomb attack"
V6, the mother: unseen (women often not shown, maybe just for modesty, or for dying differently, or getting sold off instead?). Possible V7-10 (per VDC's list of 10 victims of this "barrel bombing") also unseen. The children, especially V3 and V4, look almost baked or dried out, like an old orange, or maybe people hanged up in a smokehouse - dark stains with lighter areas - heavy smoke-staining, largely washed off? (see V1, side of face, and all have wet clothes) Some kind of cap attempted? (lighter patch starting near the hairline, V1 and V2) Made to breathe smoke is a sign of abusive captivity by Islamists. General stained appearance, slightly red-orange, seems odd though, a possible gas clue. Cap or not, some of the victims' hair sticks up, and seems crusted that way (V1, V2, V5) - were they left hanging upside down for a time, in a particulate-dense environment (like a smokehouse)? Perhaps minus hair washing for a while? Falling gas canisters can't do that to their victims. deep, dark rings around the eyes, as if super-tired (unclear what this suggests, likely poison-related, maybe a slow death) Note 2-23/24: Important! Split-off to below: Raccoon Eyes? white residue: on v4's face, around nose, corner of mouth, on V3 (girl) along upper eyelids (as if upside-down), and possibly on her sweater (as if right-side-up?). I guess this is mucous that reacted with the chemical, and fizzed up into this. I've seen similar before, with many "Caesar photo" victims, who were clearly tied upside down, but that tends to be bright yellow, and more copious. Here, in the nose and eyes, holding the eyelids open. "Prisoner #" j-2218, in the March, 2013 folder. 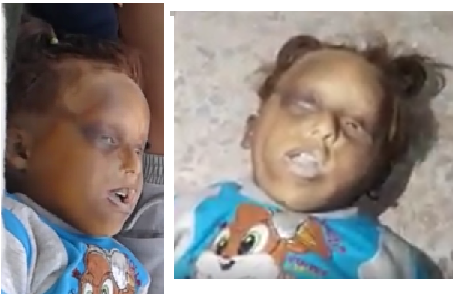 Other "Caesar photos" victims resemble the children here, at least a bit... it's not the usual look there, nor quite the same as here, but for what it's worth: 227-411, 1-11-2012, 227-2182 24-6-2013, a better example I've seen but can't re-locate now... one with extra smoke. But none is quite the same - this is something I've never quite seen before. The father's face seems different, not as dark, no white residue, wetter, smooshed, apparently laid on his face, but probably after death, maybe after being cut down... his hair seems to stick up too. V4 has an odd dark spot on his belly they don't bother covering up. Is that a bruise? Did someone punch him in the belly a few days before this? Add, 2-23: V2 is the bluest, but his blue is perhaps not cyanotic - it may be more bruise-colored and mottled like bruises, blending into burns on the left side. Was he beaten about the face shortly before he died? Is a boy hanging upside down an attractive punching bag to salafi terrorists? Perhaps. But unlike the others, this victim doesn't really seem to have any black eyes or possible raccoon eyes, nor sign of a broken nose. So why suspect him of getting punched? The Reuters report notes the video "showed the corpses of four children stretched out on a floor, their lips blue and dark marks around their open eyes." These don't seem to be 'marks,' but the color of the skin there. This might be of great interest. V1, V4 and V5 at least seem to have these heavy, dark rings. V2 doesn't clearly*, and V3 probably does. This could be a more general kind of "black eyes" or "dark rings" in the extreme, but a source tips me off that these might be "raccoon eyes" (properly: periorbital ecchymosis - Wikipedia). Usually, 85% of the time people say, these are caused by a basal skull fracture, tearing the dura meter, between the brain and the skull. The tissue bleeds, and it pools up inside the skull, visible under the thin skin of the eyes. Such a fracture is most often to the anterior cranial fossa - something has hit a person hard in the back of the head, at the bottom part of the skull just above the neck. Note the backs of heads aren't seen to rule this out. And the toddler's head looks possibly misshapen, with eyes askew. *V2 may have subgaleal hemorrhage - bleeding between the skull and scalp - if that can happen from the same (externalized to outside the skull somehow), and extend all over the face - maybe the blood from his dura mater is spreading here first, and barely pooling in the eyes. My theory, running it by my source. Note 3-14: That wasn't a good theory. Rather, my source suggests he might have had his face badly scalded at some point, and this is partly healed, with uneven areas of red and blue discoloration. I can see that. I'm not convinced, but it's a possibility that suggests abusive detention for some time prior to death.). Maybe ... I'm checking if this must be periorbital ecchymosis, or possibly some other dark rings/black eye effect. If it is the real deal ... the 85% likelihood of fracture is under normal circumstances. In Syria now, and maybe in an Islamist dungeon, that may not apply. But other causes of this tend to be other damage in the same area of the skull, from surgery or sometimes from cancer there, and (never?) poison-induced, from tiredness, or a simpler injury like a punch in the eyes. 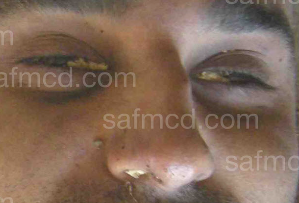 So if these are proper raccoon eyes, in several members of one family, it's about 99.5% likely someone hit them all in the back of the head some time prior to the chlorine attack. Maybe the canister managed to whack each of them as it landed? This effect may take a day to form. Maybe they were knocked unconscious by their captors, or simple home invaders, before tying them up for the first part of a slow gassing, and the rings are still forming in these videos from several hours later? * Raccoon eyes (caused only by injuries to the skull lining, here almost certain to be violent). * Regular dark rings (Wikipedia: periorbital dark rings), which are caused by any combination of anemia, low blood oxygen (suffocation included), fatigue/lack of sleep, excess eye-rubbing, or any poison or medication that dilates blood vessels. Many dead people will have these, and that might be what we see here ... or part of it anyway. I'm still not 100% certain what this is, but I lean to the first option. Periorbital ecchymosis vs. dark rings seems (by images) to be different in filling the entire eye socket pretty evenly with blood, above and below the eye, swelling both lids (see Wikipedia photo, or an image search with some extreme (graphic) examples). Standard dark rings start at the lower corner and spread mainly over just the area beneath the eye, not usually above, or to a much lesser degree. Check the upper eyelid in the ecchymosis photos where the bottom darkness prevails, and you'll see that part's darker, but it's all darkened and is or will be black, then brown, etc. like a bruise. Also, see the Baytounjis above compared to the eyes of the Caesar photos victim beneath: he's got dark rings and puffiness, and the family has something different. So, I'm pretty sure someone hit them all in the head a day or more prior to the gassing. The assault may have been 2-3 days before these video were taken.These eye rings look non-swollen, non-red, sliding to brown, and maybe about 1/3 healed (possibly deniable - it looked bad at first, and by this point people might think that's just dark rings, from the chlorine or whatever). I'm no stranger to deciding on things that the rebel story left no room for, and I have adequate reason to do the same here. Sorry to ramble a bit in getting there. Of course one hit in an internet search isn't much to go on to call this a likely Christian family. But ... I looked into it more, and it still seems a good point to me. An indirect Syrian contact tells me the name بيتونجي means expert in concrete, or concrete mason, from the French béton, for conctete. ("ji" I guess means worker in). I couldn't find easy verification of this, but oddly I think this strengthens the value of the clue. In Google Translate, I tried concrete, cement, and béton and none directly translated to the root baytoun ( بيتون ). The current general Arabic for cement is Asmant, apparently from the English. Baytound doesn't even appear as an alternate translation for any of the three. Was it only used up to a point in time? Or maybe it's too limited in space to appear here? One source I can now make sense of uses the word in a non-name sense: A Facebook post from a construction-oriented account (prefabricatedhousesdgror, fond of adobe and masonry as well) shows a small, heart-shaped cement pool full of water, with shovel laid across it. The text is two words that translate "Baytounji lover." Okay. That's cement/concrete work. (I'm hazy on the difference). The heart-shaped pool is "near Latakia," by post details, and by related links the person who used that phrase may be in or near Tartous province. www.shaamtimes.net (Syria), syria-news.com/ (Syria), www.sauress.com (? ), a re-post from Al-Manar, (Lebanon), https://sh22y.com (Syria, I think?). That's almost all of them. It's not used widely by al-Jazeera or anyone else. It's a local term used mainly in Syria. Huh! And as a name, it still appears only in Aleppo that I've seen. It's seemingly associated with the Christian community there (but not certainly linked, and maybe not exclusively). If that's the real name of this killed family, nothing is proven, but a very troubling possibility would seem pretty likely to be the truth. So why would they go ahead and say the name? Well, it's so rare ... well, someone in Syria should be able to recognize it and match up any missing Christian family of that name. So partly, it's "good question," and partly "they just don't care." A likely Christian family in Aleppo with captivity clues was likely hanged upside down and murdered with some horrible gas and/or smoke. This happened as Islamist rebels liquidated property before fleeing to Idlib in the amnesty deal, and as they sought (always) to blame the government for fresh crimes. The mother might have been killed differently. There's no reason to suspect any aircraft were involved in this tying up and gas-roasting-? ?, aside from that yellow tank in someone's home and the story behind it. Totally unseen, a woman just sat there and died Nov. 23 (and she's unidentified by everyone), two people Dec. 8 (both men named, but some disagree on one's gender), perhaps two other on Nov. 28 (unidentified and no age/gender specified), and perhaps five more on December 9 (unidentified and no age/gender specified). But the precedent set by these barely-named first deaths is not good, as we see people getting more and more vague about who's dying here. Human Rights Watch refers to this same family death, with less detail, and to the other cases with almost no detail. They fill in the gaps with a nonsense story from Islamist activists, and make moral pronouncements as if they know the truth now. Ole Solvang, deputy emergencies director at Human Rights Watch, is quoted saying “The United Nations Security Council shouldn’t let Syrian authorities or anyone else who has used chemical weapons get away without consequences.” To back that up, "Human Rights Watch called on the Syrian government to immediately stop using chemicals as weapons," and may have offered complete impunity to the actual killers, as they left east Aleppo Scott-free in a line of green buses. Note: a rough post, to get in there while people are still paying attention, now fairly complete, but may be added to. Villains that they are, Syria and Russia both deny the allegations, calling them fictions spun by the Islamist, interventionist "opposition" to scuttle upcoming negotiations and keep regime change as everyone's goal. (Reuters) There's much logic to that, and precedent for it. But they don't seem to have the specifics to explain the evidence, meager though it is, or to counter the charges like we'll try to do here. HRW is of course notoriously biassed in against governments that the United States has been trying to overthrow. Their reliability as judges of fact vs. fiction is dubious in such cases, which obviously includes Syria. I'll skip a fluff re-explanation of that here (but see as needed Alternet: Nobel Peace Laureates Slam Human Rights Watch's Refusal to Cut Ties to U.S. Government), and get right to testing it by the specifics at hand. However, it's not explained and not at all clear just what purpose these alleged gas attacks would serve in that strategy. Collectively they got 8 dead civilians, and no rebels affected, or apparently aimed at. Aleppo was cleared of the "terrorists" by cutting supply lines, enforcing embargoes, standard fighting and negotiated surrenders. It was not at all due to some random chlorine plumes. Their interactive map shows a reported chlorine drop in a district, and then a few days later the government takes that over, as they were doing across the whole area, with predictable directions. To me, the sequence HRW is more consistent with Rebel false-flaggers about to flee their districts, anticipating government moves and coordinating their claims - but guessing too soon in most cases. Further, chlorine gas has little reasonable use, to kill or otherwise. In some combat situations, it can be used to deadly effect, if the gas can be concentrated, the victims are pinned in by gunfire, or so much is used the cloud is huge and inescapable (some cases are mentioned below). In a gas chamber, it could be a sure and horrible death, but a slow one. But just fired into a city from a distance, in a couple of rockets giving off limited plumes, is not likely to do much to anyone. Chlorine is very common and easy to fake. But surely that's not why "Assad" is using it... It must be because by now, there's a strong record of acceptance that the Syrian government drops chlorine on people. They do it routinely, it's accepted, since mid-2014, with a number of improvised methods and always aiming for civilians. HRW brags that they alone have "published reports on the Syrian government’s use of chlorine in May 2014, April 2015, June 2015, and September 2016," all reaching similar conclusions to this fifth installment. The logic of it doesn't seem to matter - HRW knows a war crime, and this is a deadly friggin' gas. This is like WWII Nazi stuff, totally banned, and people need to be held to account. Identifying with certainty the chemical used in the attacks without laboratory testing is difficult, but the odor, signs, and symptoms that victims and medical personnel reported indicate that government forces used chlorine. Words were reported to them. They cite people describing a smell like cleaning products, as if that proves they really smelled chlorine, and they couldn't make it up or be coached to say that. But anyway, there was some real chlorine, in at least one case, so maybe they did smell it. But how was it delivered, and by whom? Over and over witnesses describe in detail seeing the helicopter, seeing objects falling, knowing where they landed and seeing how they didn't explode. But as usual, no one was able to put a camera lens between his eyes and that event - no one was able to provide video of these objects falling from the helicopters in any of the cases. HRW considered 8 cases here, and the best they got is a video by Aleppo Media Center from November 20 22, This shows a helicopter above (no sound - it's very high), then a cut - to a different day for all we know. And there's the green gas cloud appearing as seen here, as the cameraman says Allahu Akbar (supposedly in horror, like "oh my god"). The actual drop of a munition isn't shown. That makes zero for eight. Maybe he got bored before that and stopped filming, or the long fall was deemed boring later and edited out. We're to presume the scenes really do go together, but they might not. 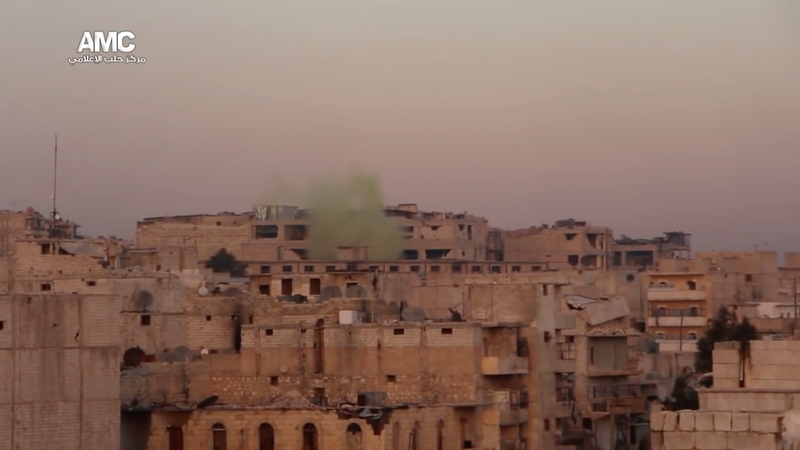 "In two attacks, journalists nearby captured the smoke on video," the report notes, adding that "Chlorine is yellowish-green in its gaseous form." Throughout the report, alleged witnesses describe chlorine exposure symptoms somewhat accurately, either because they saw them or just know what to say. They describe that color, the smell (akin to chlorine bleach), and the heavier-than-air quality, sinking into basements. This is accurate enough. But the visuals that should serve as proof are half-wrong. HRW's headlining image is this still from the Aleppo Media Center video linked above. It looks like colored smoke, rising high and drifting on a gentle breeze, with no sign of falling back down, This was noted by Charles Shoebridge and readers on Twitter. Chlorine wouldn't do this. It could be blasted high, but would drift back down, and wouldn't wisp around on the breeze so easily. As noted by Shoebridge et al., the color is also suspect, a bit too rich of a green hue. It seems debatable in the Aleppo Media Center video, but this appears a bit red-tinted. At right is a comparison of that, on the left, and adjusted on the right. By this, it seems not yellow enough, not pale enough - and of course not heavy enough - to be chlorine. 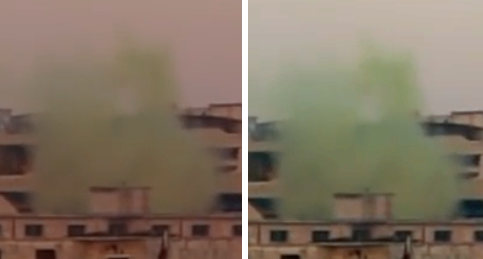 This is some kind of green-colored special effects smoke, not any chemical weapon. Another video showing chlorine gas, of two cited by HRW, by On the Ground News (Bilal Abdul Kareem) has similar audio. No helicopter is heard (again, perhaps it was too high). But there's a loud roar, almost like a passing jet, or an incoming rocket, capped with what sounds like a fairly heavy boom in the mid-distance. Someone on screen knows "he's dumping chlorine!" almost as soon as that thud is heard. Peeking around the corner a few seconds later, there's the green cloud, creeping along the ground. This is how chlorine behaves, and the color seems correct - pale yellow-green. It might be originating closer than that impact happened, and already creeping before that. This slow-creeping field of the stuff goes back meters, and has been rolling for a little while. And the blast sounds distant. Coordinated? They're saying "no one should breathe" "go up on the roof." But it's only heavy an inch or so up, and has only mild effect a few feet higher and a few feet back. The effect is likely real, but only so strong. Note how they respond: No one faints, and after documenting it, they get away from the gas. Not everyone does that, reportedly. Some people inside houses filled with the stuff allegedly sit there and die. (see below). There was that family of six on November 20, and it's said two people died from chlorine in eastern Aleppo on Decembe 8, as this better plume was witnessed. (it's said they died from a different plume in another district, however, maybe at a different time). The OGN video appears to show the real deal, chlorine gas hugging the ground like it should. But how it was delivered, with that whooshing noise, deserves more careful study. 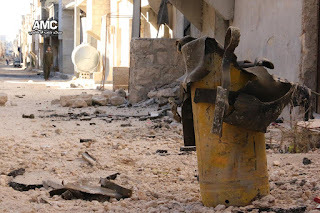 There have been several types of alleged chlorine bombs used since 2014, starting with gas cylinders, graduating in 2015 to barrel bombs, where chlorine precursors are mixed inside upon impact (which is very unlikely, by the way - the impact and/or explosion would disrupt the mixing and produce no gas). 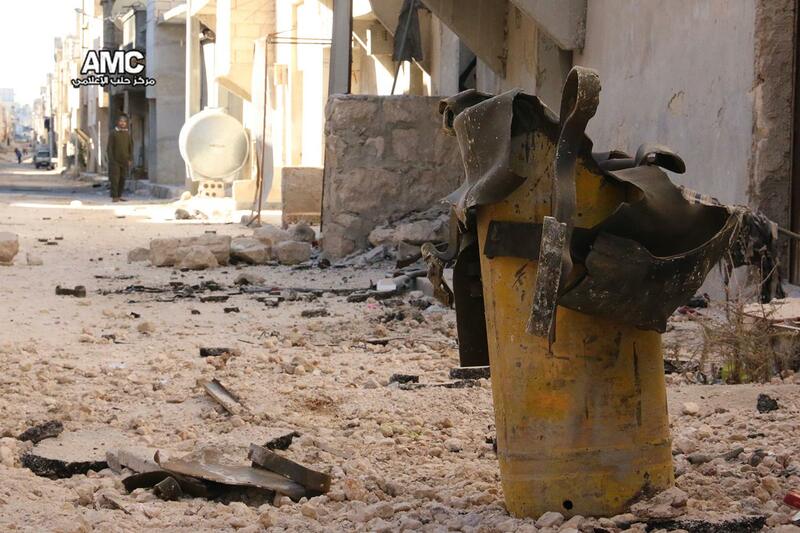 Cylinders inside barrel bombs and other types have been dropped in front of rebel cameras in between and since. They had plenty of time to re-bottle and relocate and perhaps produce fresh stuff during their long tenure as de facto managers there. (It's been back in government hands now for some time). Also, someone had some chlorine, or empty tanks anyway, from a Jordanian company. We don't know what this means. Also, the regime allegedly has lots of chlorine, runs the SYSACCo plant now (if it functions, unclear), and drops it from helicopters. No one knows why, but it's criminal. Pending proof these tanks fell from a helicopter, or that they didn't (I haven't seen it yet), let's get back to the Islamist opposition's narrative, and a major problem with it no one has noticed so far. Relevant fact: chlorine does not cause unconsciousness, nor paralysis, nor even confusion or sleepiness. It's effect is mostly mechanical; it turns to hydrochloric acid on contact with water or wet tissues. It causes red, irritated eyes, perhaps skin irritation, lung damage, severe coughing, possible nausea, headache, and later on in severe cases, cyanosis (a blue color shift in the blood and skin, especially in the lips). From the inside, the patient feels burning eyes, severe coughing and - most pressingly - an acute pain in the chest, with tightness and labored breathing, causing agitation or even panic, and a strong desire to get the hell away from this gas.Dizziness can occur, and sometimes an odd weakness in the legs tempts the victim to lie down. But they remain alert and aware of the need to get away. If you doubt this, go look it up. Most good sources relate to World War I, but the molecules are still the same. Update 2-18: This does deserve more explaining, besides double-checking: I'm doing research now, and will post a piece soon, with a link added here. Update 2-20: that explanation, for the doubtful. Most choose to move out of the gas at first chance, are able to, and wind up surviving just fine after a rough spell. People can die from chlorine if they're trapped somehow - like in World War I, pinned down in a trench by enemy fire, or put into a huge cloud they can't even walk out of before succumbing, or just from getting a very concentrated blast. The damage is done during exposure, however intense and however long that is. Death only come later, as the damage and the body's often fatal response play out. At the very end, the victim gets weak, loses consciousness, and then dies. But this is after a while of enduring it, when the coughing gets too difficult and breathing stops, and as the body is shutting down. I can't see how, but perhaps there's a way chlorine would knock you out right away in some fluke circumstances. But here, people in the bomb damaged houses seem to just die instantly, or instantly become inert, loose consciousness or "fall asleep." And it happens in perhaps every case where the bomb allegedly lands in someone's home. In fact, if one passed out from something else earlier, the chlorine would likely have the same effect as smelling salts, and snap the victim awake to get the hell out of there. But not in these stories. Like poorly-scripted silent movie heroines, they lay down in the sleepy fog and await rescue. But the gas makes them unreachable to rescuers, who claim to lack gear, and to sometimes pass out themselves... and so the implausible victim slowly dies inside. This happens regularly, as if to keep the reminders fresh. Is someone locking them inside these houses? No. Who could get there quick enough after the bombing? It takes just seconds to get out the door. Were they maybe locking people inside some unrelated place we might call a gas chamber? Some evidence says this is quite likely, and has even been the norm, down the line from the earliest alleged CW attacks to the present.For now, let's just keep an open mind and note the provided explanation doesn't make sense. We're presented here with about the same formula we've seen since the start of the chlorine allegations - a bomb-damaged house, often looking long-abandoned, with the alleged delivery device in there, said to be filled with chlorine, and the family all just sat there and died. 2.2) November 20: The "Baytounji Family"
In HRW's report are 8 dead civilians verified, and at least two more reported, out of just 8 incidents. 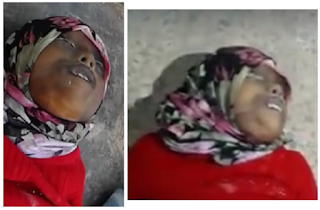 I knew about those listed by the VDC, but that didn't include the bulk of these: an entire family of six, killed November 20 in al-Sakhour district. A witness said this chlorine bomb was dropped shortly after midnight, early on the 20th, impacting a house near a vegetable market. "The smell was like the liquid we use when we clean the house.” Videos show a house in ruins "and remnants of a yellow cylinder amid the rubble." It's said the family died here; A medical activist told them he "put a wet cloth over his mouth and went out to check the neighborhood," finding in one house "five dead civilians, a mother, father and three children. Their faces were blue." Other activists and reports agree with photos and videos, citing six dead and showing 4 children. The man is seen in some cases, but the woman isn't. I haven't watched the videos yet. That will get a special space if I do. So a better resolution image analysis forthcoming. (Update 2-19: that's done - see here.) Here's a still from a clip of it in HRW's video, with too little detail to say much about the poison. They seem to be two girls and two boys, maybe 3 boys and a girl. They show no sign of being trapped beneath the rubble (light dust usually, torn clothes, injuries, etc.). They may be a bit dingy and smoke-stained, which is a different sign (abusive captivity). But they weren't pinned down under the rubble. So why didn't they flee the choking gas? Four different children, and two adults ... between them, no one thought of a better plan than to just sit there and die? Was it because they didn't have their shoes on? It's not clear why they're off here, but they're often removed before an Islamist executes you, and maybe as they start to process you. They did get out of bed and get dressed up in daytime clothes, pretty quickly after this "shortly after midnight" attack... strange that. But shoes or not, they didn't get out the door in time. Note: hostages aren't given pajamas to sleep in, and don't even have to die at the stated time. Reuters heard these were members of a Baytounji family. "Human Rights Watch has not been able to independently verify the names." There seems to be no record in the VDC martyrs database of people of this name dying, perhaps ever (it's hard to be sure what spelling they would use, and I don't have the Arabic spelling). Unless they were listed under a different name and a different cause, it seems this usually exhaustive source missed out on this mini-massacre. Dec 8 attack: "Al-Khattat said that the attack killed two people: Ammar Shohaiber, around 40, and Mohammad Abrach, around 50." Other sources tended to agree. But as HRW notes, the VDC lists Ammar Shohaiber and an unidentified woman - no ages given, but they seemed like a husband and wife - and the age similarity of the men is notable ... but whatever, in one or two locations, two people with decades of wisdom behind them had their houses fill with chlorine gas ... and they just sat there and died? A 55-year-old woman was killed, November 2, HRW heard, after the chlorine tank smashed through her roof. No one could get close enough to help her open the door, and drag her out, because the gas was so strong you couldn't stand it. But she must have, you know, passed out. Neither HRW, VDC, or anyone that I've seen got her name. An alleged two other people were said to be killed on Nov. 28. No genders or details were given. HRW couldn't confirm anything. Maybe that witness misread the memo, seeing 12-8 (when two died) as 11-28, and so he gave the wrong day? There was a reported attack of 11-28, but no one else mentioned any deaths. Some sources also reported another five civilians killed after the December 9 attack (again, no details). HRW couldn't confirm it, but it's not likely to just be made up. Most likely, as usual, this is in one gas-filled home, where five more people just sat there and died from the chlorine gas that "Assad" dropped on them, for no good reason. That's a total of perhaps 16 implausible deaths, or even more, in this chain of 8 attacks. HRW gives no explanation for how these deaths happened, or whether it's usual or expected. If they did, they'd point to precedent from Syria in the last 3 years, which is meaningless. Did the nature of chlorine change recently? Is this a different chemical, or some combination, being dropped from helicopters? Or does the true story follow different lines entirely, ones that run along the ground? 3) What Else Did HRW Miss? Human Rights Watch start their survey on November 17, but list the first incident on the 18th. Their interactive map also starts at 11-17, and blank - no chlorine attack that day. But oddly, one was reported and condemned, in a prominent but shady string of reported events I'll write up soon (see here at ACLOS for now) Chlorine victims went to the clinic, which was then bombed, and babies in incubators had to be removed for their safety - all the babies lived, it was said - including the one that was already dead and stiff with rigor mortis before the alleged hospital bombing. Now HRW adds - the chlorine part didn't happen? What next? The barrel bombing of the hospital was staged? Earlier attacks: Sept. 6, east Aleppo, government blamed: 2 fatal victims, both seen, neither seems exposed to chlorine (Monitor). Aug. 2, old city, Aleppo (government-held) a quick-killing CW inside a breached tunnel kills 5 soldiers, chlorine rockets after kill rescuers and civilians, a reported total of 13 killed - here's a rescue worker who died (via InGaza). He displays cyanosis (general purple color all over, his blood is in deep crisis, if he's even alive here), skin irritation (redness, and the mud suggests it burned, it might seem like mud could soothe that). Importantly, there's blood from the nose, and he'll have blood in the lungs, and maybe thick protective mucous now, complicating things. He also might have eye damage (lids would look swollen/puffy, and they might). 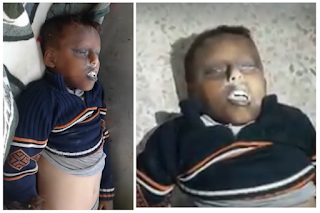 Further back, the Taleb babies killed by chemicals on March 16, 2015 in Sarmin, Idlib province. Helicopters dropped a chlorine-mixing barrel bomb on the home of a family of 6, all of whom just sat there and died in their basement home. Grandma fell asleep on the stairs trying to leave the babies behind. Mom and dad passed out, but were alive and able to talk at the hospital before dying. The three babies were rescued later, at least 2 still alive. They were rushed to this clinic where they die on camera with poor assistance. And it seems they were never exposed to chlorine, and died from something else ... white, calm eyes, pale skin, no blood, no choking, no coughing. In fact, they're barely breathing, not moving or responding, and totally limp - they're comatose, and then somewhere they slip over to dead. All this suggest most likely they were overdosed with a CNS depressant drug like moprhine, demerol, or other. (ACLOS, Monitor) This doesn't come from a dropped barrel bomb. It's hand-delivered by locals, with needles or pills, somewhere before this MSF-supplied field clinic, but perhaps from its shelves anyway. The next day, rebels responded with a widely discredited allegation, a chemical attack by the regime in Homs, perhaps with sarin. Exactly seven men/rebels were killed, in what became known as the first deadly alleged chemical incident of the war. But U.S. and most official sources dismissed this, some seven men must have stood there and inhaled an entire canister of the non-lethal incapacitating agent BZ, after it was dispersed in the street. (Monitor analysis). That sounds silly and doesn't explain anything, but at least BZ is known to incapacitate people so they might just sit there and die, eventually. But again, the kind of chlorine that exists in the real world does not do that.